Maj Michael Brown RLC has been awarded the Burch prize as top student on the Battlespace Technology course run by the Technology School at the Defence Academy in Shrivenham. 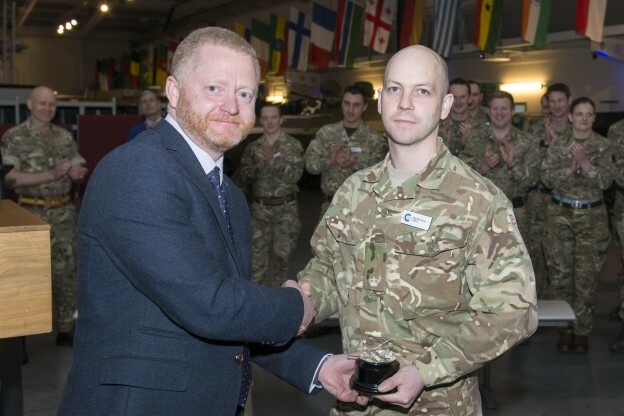 Maj Brown received the prize from Dr Matt Chinn, Head of the Technology School at the Defence Academy. The Battlespace Technology course is run for newly promoted majors from across the Army destined for appointments in the Capability and Acquisition career field. It equips 48 majors each year with the technical knowledge and skills required for demanding assignments in Army Capability, DE&S and DSTL. Maj Brown received the award following 30 weeks of education in military technology, information systems and defence capability acquisition, for which he received a Post Graduate Diploma. In August 18, following a few more months at ICSC(L), he moves on to an ECM Project Team appointment in Abbey Wood where he will put his new skills immediately into action. If time and opportunity permit, he will also complete his dissertation to receive his Master’s degree.